The Archives and Special Collections Center has a strong relationship with the Institute for Judaeo-Christian Studies here at Seton Hall University. Five manuscript collections here at the A&SCC came to us through the Institute, and are rich resources for the study of Judaeo-Christian relations. The Edward H. Flannery papers, 1965-1996, Mss 0012, the Nancy Forsberg papers, 1913-2011, Mss 0022, the John M. Oesterreicher papers, 1920-2000, Mss 0053, the Rose Thering papers, 1944-2005, Mss 0016, and the Michael Wyschogrod papers, 1941-2002, Mss 0013 are important collections documenting the efforts of individuals striving to increase understanding among all people, especially Christians and Jews. Now these five collections have a new digital resource, the Judaeo-Christian Studies Collections. Portions of each collection are being digitized and made available through this digital collection, and include manuscripts, photographs, pamphlets, correspondence, newsclippings, and other materials. We think this collection will prove to be an invaluable resources for scholars in Judaeo-Christian Studies or in any aspect of religious studies, and will continue to add to the collection. Bridgette, a graduate student in the Judaeo-Christian Studies department, has put a great deal of work into processing these collections, digitizing selected items, and making them available online. Thanks to Bridgette, and to Fr. Frizzell of the Institute for Judaeo-Christian Studies, these materials are now widely available to interested researchers. Check out the collection, and subscribe to the updates to see newly digitized items as they are uploaded! 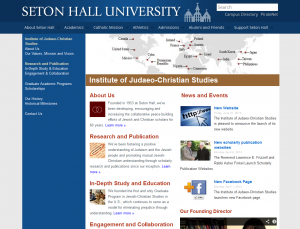 The Institute of Judaeo-Christian Studies at Seton Hall University has a new website featuring the scholarly and community activities of the Institute. 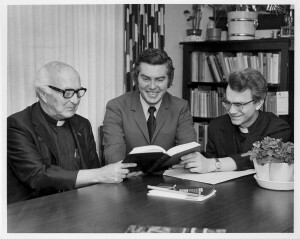 The IJCS has a long-standing partnership with the Archives and Special Collections Center, and that relationship is highlighted on the Research and Publications page on the new website, which describes the four large archival collections that have been gifted via the Institute: the John M. Oesterreicher papers, 1920-2000, Mss 0053; the Michael Wyschogrod papers, 1941-2002, Mss 0013; the Edward H. Flannery papers, 1965-1996, Mss 0012; and the Nancy Forsberg papers, 1913-2011, Mss 0022. The new home page for the Institute describes the wide variety of work conducted at Seton Hall dedicated to Catholic-Jewish relations. The site, like the Institute, is an excellent resource for all those interested in Jewish-Christian scholarship, understanding, and peace-building efforts. In addition to the archival collections housed at the Archives and Special Collections Center, the site provides information about and links to scholarship and writings from the current Director of the Institute, Father Lawrence Frizzell, past and current publications, programs and lectures, the program of study in the Jewish-Christian Studies Graduate Program (the only graduate program of its kind in the United States), scholarship information, and the history of the Institute. The Institute also has a new Facebook page to keep in closer touch with students and scholars, and both sites provide links to the Institute’s regular radio program on WSOU, the Kinship of Catholics and Jews, which is also available for download via iTunes. 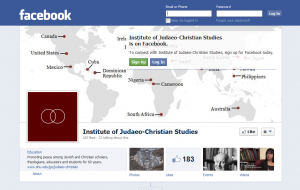 For any scholar interested in Christianity and Judaism, the Institute of Judaeo-Christian Studies is a unique and invaluable source of knowledge and exploration. Visit the site to find out more!